Okay, how many of you have kids? Raise your hands. Well, I certainly don’t — but who doesn’t love something deliciously sweet and artificial every now and then?! Fruity Pebbles are, by nature, weird. Brightly colored and full of a mysterious flavor that in no way resembles fruit. These treats would certainly appeal to children — and those of you who really, really like SUGAR. 1. Coat a 9×13″ pan with cooking spray. 2. Melt the butter and marshmallows in large pot over medium heat. Stir until you get a lovely melted butter-n-marshmallow goo. 3. Add the cereal to the butter/marshmallow mix gradually. Stir well to make sure that the cereal is evenly coated. 4. Press the cereal mixture into the prepared pan and let cool. Cut into bars. So great to see this on Stumble Upon, I made these myself and was wondering if anyone else had ever tried? I thought the fruity pebbles were a little bit too sweet. Was thinking maybe toning it down with regular rice crispies (half and half). Then the idea of a Cocoa Krispie treat came to mind. You could top the whole thing with some caramel or something. Ty – Your grandmother’s version sounds delicious! 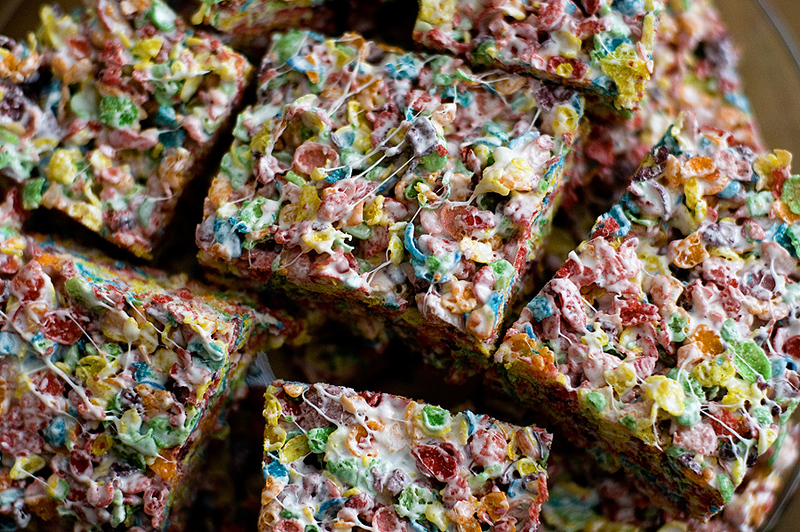 I love bars like this…cereal bars that are loaded up with my fave childhood cereals and other goodies thrown in.